It's not only the season for graduations, but it's the season for weddings too! So the ladies at class last week were able to make two wedding cards. Both are CASE-d from ideas I've seen elsewhere. 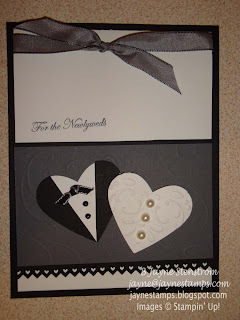 I love how this card uses the Full Heart Extra-Large Punch and makes a "tuxedo" and "wedding dress". Of course, we had to have some Basic Pearls on the wedding dress, right? The buttons on the tuxedo are actually the smallest Basic Pearls colored black with a Sharpie marker. The words are from Teeny Tiny Wishes. Love that stamp set - so many versatile sayings in it! This next card is so quick and easy, but gorgeous too! The cardstock is Shimmer White cardstock - and it does just that. It gives a great shimmer to the card. 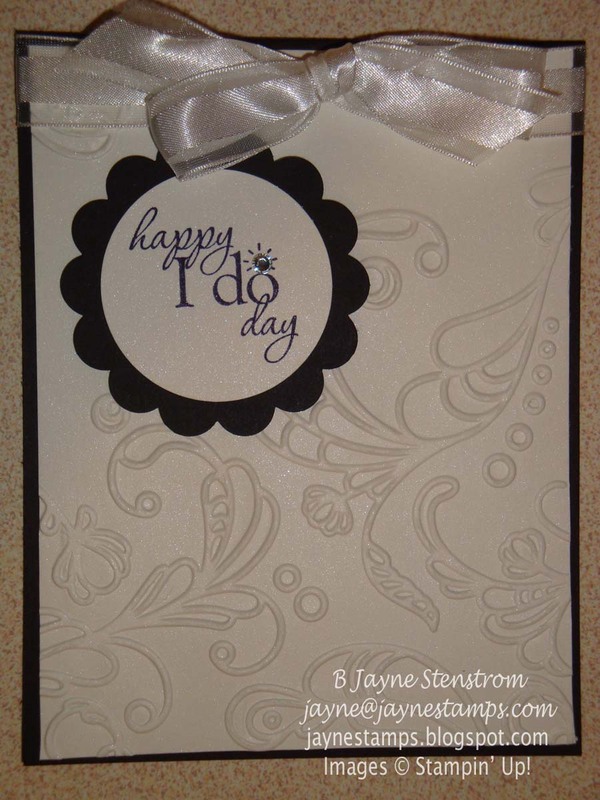 The Elegant Lines Embossing Folder was used to give it depth and texture. The words are from the stamp set Word Play, and with a Basic Rhinestone above the "o", it adds just the right touch of bling without being over the top. Of course, the 5/8" Organza Ribbon tied in a bow at the top adds another elegant touch. I just LOVE this ribbon! So if you have some weddings coming up in the near future that you need cards for, I hope these cards give you some inspiration!